Dr Cathy Coelho, Clinical Lecturer at Plymouth University Peninsula School of Dentistry (PUPSD), has been awarded the Association for Dental Education in Europe (ADEE) Early Educator Excellence in Dental Education Award. 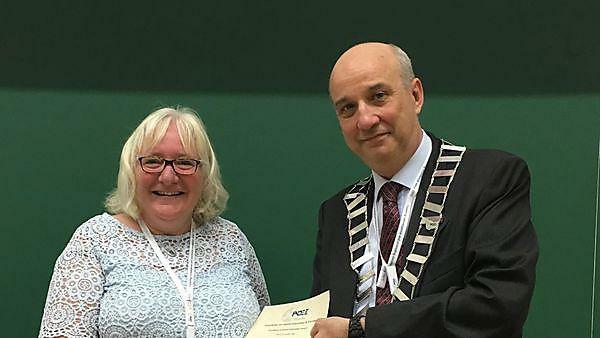 Cathy was presented with her award by Professor Corrado Paganelli, ADEE president, at a presentation at the ADEE Annual Conference in Barcelona. Cathy was recently awarded a Senior Fellowship by the Health Education Academy. She has 28 years’ experience as a dental practitioner and has lectured at PUPSD since 2012. She is a Master in Clinical Education and has published two papers on dental education. She specialises in enquiry-based learning, remediation for struggling students and the training of academic tutors. Cathy is Year 4 Lead, Clinical Audit Module Lead, Widening Participation Lead and Senior Personal tutor at PUPSD.